In September and October 2017 Taiwan-based company Cobinhood held an ICO to crowdfund their exchange.1,2 Alongside many features such as margin trading, fiat deposits and withdrawals as well as advanced security measures, their unique selling proposition was to build an exchange with zero trading fees. Investors in the ICO received the COB token in exchange for their investment, which has been one of the most traded assets on their platform ever since. As an exchange token, COB has several utilities, which will be outlined in this article. Looking at COB’s utilities, COB token holders have been eligible to receive two types of airdrops since the inception of Cobinhood. The first option available is called ‘Airdrop-Lite’. Some tokens that get listed on Cobinhood exchange agree to airdrop a percentage of their supply to COB token holders. The amount of airdropped tokens depends on the amount of COB tokens held in a user’s account. The distribution is based on the “first come first serve” principle, meaning users have to be quick to claim their airdropped tokens, since there are only limited spots available. Cobinhood exchange already airdropped 11 different tokens to COB token holders (Lympo, LALA World, Dent, SyncFab, Playcoin, FuzeX, Achain, Hoqu, Universa, Bitcomo, Luna).7 The US Dollar equivalent of the amount distributed varied, but has once even been up to 100 US Dollars per token holder that claimed the airdrop. This article outlined the utilities and benefits provided by the COB token. By holding COB, individuals are eligible to receive airdrops of selected listed tokens and underwritten ICOs. By paying margin trading fees and withdrawal fees with COB, users can receive a 50% discount on these fees. 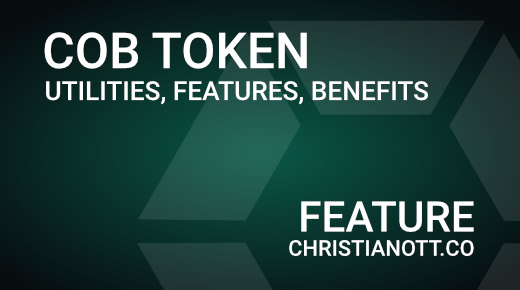 COB also enables token holders to acquire tokens issued in ICOs underwritten by Cobinhood for a reduced price. COB Points are given to users for holding COB and can be used for a variety of features. Other benefits of the COB token include higher liquidity due to multiple trading pairs, enabling users to participate in trading contests as well as a decreasing supply by burning withdrawal fees paid with COB. Distribution details are from CoinMarketCap’s historical data about the COB token. January 05 was the latest date, where you had to deposit COB tokens to Cobinhood exchange to be included in the snapshot for the CMT airdrop. According to CoinMarketCap, the circulating supply of Cobinhood was 344 million on January 05, 2018. According to the COB/CMT calculator, 344 million COB would have given you 16 million CMT tokens. Since every investor couldn’t redeem his/her first 500 COB for CMT and not every investor will have deposited their COB tokens to Cobinhood exchange or will have redeemed 1 COB for CMT tokens and US residents couldn’t participate in the airdrop, I think the amount is way lower than 16 million CMT tokens. Let’s assume that 10 million CMT were exchanged as bonus for COB token holders (although I think this number is still too high). This would be 1% of CMT’s total supply. The pie chart shows that of the allocated 650 million DEXON for the DEXON foundation are reserved for an airdrop (equaling 32.5 million DXN).